Most users would agree that the world of displays comprises of 1080p or Full HD which is the currently affordable and widely available standard, and 4k or QHD as the extreme or top end. But for a person looking to purchase a monitor as a replacement or an upgrade, FHD is very affordable but offers nothing new while 4K Monitors demand expensive hardware to maximize the viewing experience. To close the gap between the two, the best option we currently have are 1440p Monitors. While not as costly to buy and run at acceptable outputs, this category still offers a huge upgrade when compared to 1080p. While there is a considerable increase in virtual desktop space when compared to the latter, the biggest benefit you can get in upgrading to this resolution lies in the 78% rise in the number of pixels. FHD has 2,073,600 pixels/81.59ppi, while QHD has 3,686,400 pixels/108.79 PPI for 27-inch monitors. The smaller the size of the monitor, the denser these pixels get. These are only numbers in theory, but in practice, a denser pixel count equates to substantially better image quality with vast improvements in color, contrast, and details. It gets complicated if we try to discuss this with you on a technical level, and the best way to believe these results is to see both resolutions for yourself to discover the vast improvements the higher standard will give. 4K, on the other hand, will mop the place with QHD regarding image quality, but as it is, 4k is prohibitive because you need a very high-end graphics card to fully realize UHD to its maximum potential. Sure, you can still play games and videos on that level, but frame rates will suffer a lot, and the video output will be subject to stutters and blurring. If you do not have the powerful hardware, or you aren’t willing to spend a fortune on new parts, going with 4k is counter-intuitive. 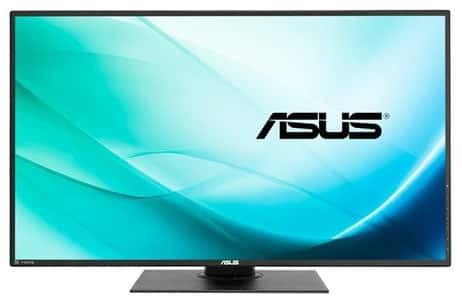 This category presents the mainstream monitors and the best value for the money for the general population of consumers looking to enjoy 1440p. The models here offer excellent performance for an affordable price while removing all the additional specs and decorations the specialized monitors are offering at a higher price point. These characteristics make these offerings perfect for most home users, although business owners and offices can still pick from these models as they are still viable for productivity applications and other basic computer tasks. Although if you are choosing an option from this category, always remember to manage your expectations. These are great products, but they are meant for the mainstream and not for the competitive gamer or the graphic designers. 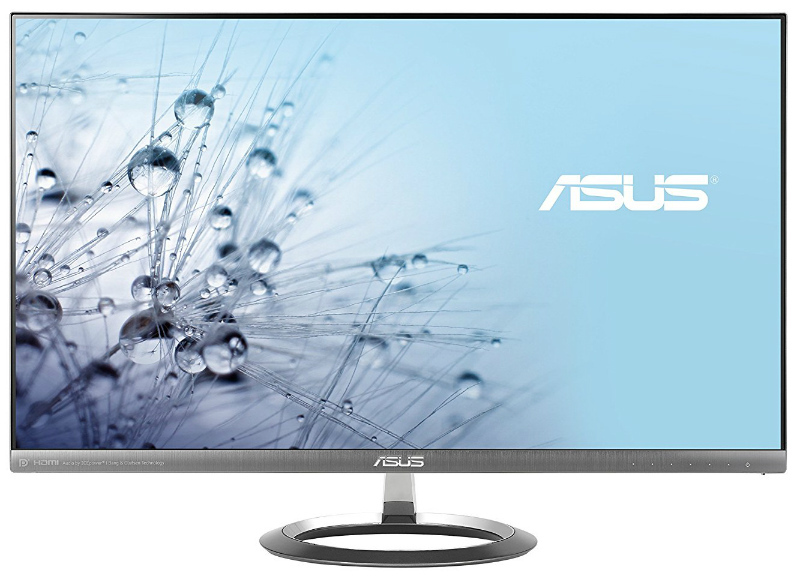 If you are looking for a general purpose display that offers brilliant images, flexible connection options, with the looks to match, and a smaller form factor than regular 1440p screens, then the Asus PB258Q is the best solution for the least amount of dollars. The best feature this model has is its specs which are comparable to more expensive offerings. 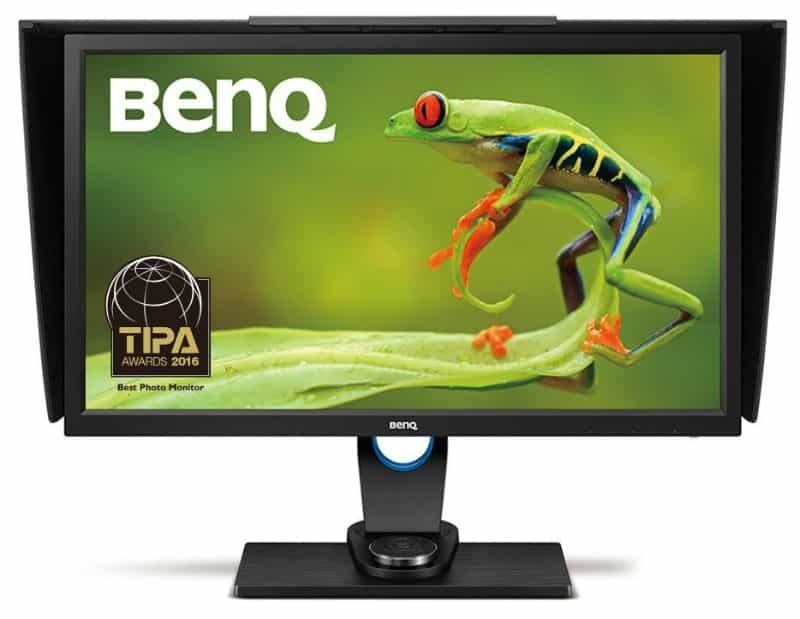 The PB258Q has a high-quality IPS panel capable of 5ms response times, 100% sRGB gamut coverage and 1000:1 contrast ratio. These are near professional grade specs, built into a mainstream monitor. While the colors are not as accurate and refresh rates are only up to 60hz, Asus includes their SPLENDID OSD which carries a Color Emulator and Trace-Free accelerator to enhance these features further. Once calibrated, the colors become less saturated, and the input lag is unnoticeable, so this makes this ideal for gaming and some editing work, completing the all-arounder description. The product also features a broad range of connection options including HDMI 1.4, DP, DVI-DL and audio jacks including speakers further adding to the value you get from purchasing this model. This product is also flicker free and capable of blue light filtering, so extended hours while working, playing or browsing will not cause you any harm. Want a bigger display instead of the model above? 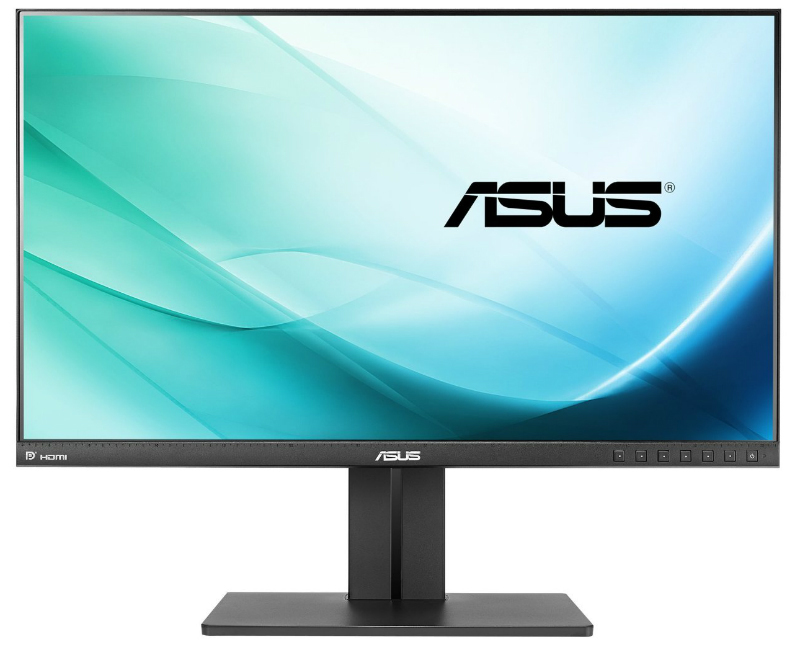 If you could do without the benefits of having an IPS panel and would want a bit more performance for gaming, you can get the Asus PB277Q for $30 more than the first selection. That price difference translates to a physically bigger monitor which has a 75 refresh rate. A little color quality and the wide viewing angles are sacrificed because of the TN panel, but you gain the higher refresh rate, even lower input lag, and better contrast ranges thanks to a higher overall brightness. This offering is an excellent and affordable choice if you play casually more often than regular users, but do not have the budget for the obscenely expensive gamer-specific models these companies make. Since this model is still part of the professional line of monitors, you can also enable PiP (Picture in Picture) and PbP (Picture by Picture) modes with this monitor. The 27-inch viewing space will show this seamlessly onto the screen and enable widespread professional applications for this product, adding to the already amazing, all around features this product provides. Like the PB258Q, Asus SPLENDID proprietary OSD features are also included in this selection, featuring decent tweaking options and safety features such as Blue Light Filtering and flicker-free operation. Mainstream PC monitors can get boring pretty fast. Most of them look the same with their matte black cabinets, strictly functional stands and built-in speakers users usually overlook. For under a hundred more than the previous entry, you can get the Asus MX27AQ that features aesthetics that are worth a whole lot more. From a physical standpoint, the aluminum finish wrapping the cabinet of this model is gorgeous and worthy of becoming a centerpiece in a living room or office. The front also features a borderless design, making the IPS panel stand out. Instead of ordinary two or three-watt speakers, Asus has partnered with Bang and Olufsen, a Danish audio company, to incorporate their ICEpower speaker technology into the monitor. This upgrade alone is noteworthy, especially if you compare it to the low-quality pairs usually used as built-in speakers (Although these are still not as good as separate speakers). On the performance side of things, the MX27AQ doesn’t slack as well. The AH-IPS panel in the display provides brilliant colors and contrasts, and surprisingly cleaner and ideal whites when compared to lesser IPS models. This option is perfect for an elegant home, or on the desk of a boss. To top things off, you get Asus’ exclusive SPLENDID modes, including Trace-Free acceleration, PiP and PbP and GamePlus mode to enhance the viewing experience across all types of usages. Another strikingly beautiful option, the Acer H277HU would give the Asus MX27AQ a run for its money despite the similarities in looks. This model instead goes for a golden color with a similar stand with a ring-shaped base. The IPS panel in this model is also quite capable of displaying brilliant colors and contrast but at a slightly faster response time of 4ms. There is some slight color skewing on the red side of the RGB spectrum. However, this is easily corrected by tweaking the color temperatures in the six-axis controls of the OSD. This monitor is also excellent for gaming since input lag registers at only a little over 10ms, which makes it unnoticeable for casual enjoyment. There are features we can expect from a product at this price point, but the premium this model commands is mainly for the ace up its sleeve; this monitor is USB Type-C compatible. 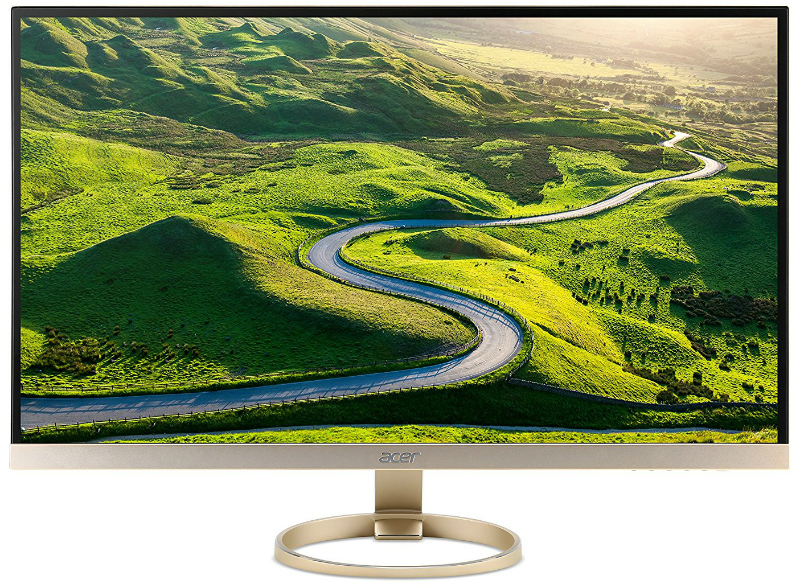 This addition means that the Acer H277HU is ideal for modern devices such as Dell’s new XPS13 or Apple’s 2016 Macbooks who only rely on USB Type-C for audio/video output and charging. That feature together with the look makes this suitable as both a charging dock and an external display for the mentioned mobile gadgets, while also adding a hint of future proofing that comes with the higher price it commands. The average human eyes can see around 7 million colors, and some exceptional individuals may see up to a hundred. These numbers, however, do not include gradient palettes for each color, that is why we see display products advertising expanded spectrums which describe quantities of 16.7 million or 1.07 billion colors. To be able to see digital images and their true to life shades and appearance, new monitors today try to provide as much range in these palettes as possible, so the screen output becomes as accurate or true to life. Kind of confusing, but simply put, the products here are the best at emulating these shades and hues, for excellent reproduction. These capabilities come at a high price since the absolute cutting edge in hardware and technologies are utilized to attain these qualities. For everyday uses, elevated attributes such as these mentioned here are not required, but for those who rely on precision in this regard such as professionals in design or editing, these are the top priority. The products included in this category are the best value for this kind of necessity, which augments the artistic capacities of these masterful creators. If you are a budding professional who uses Adobe programs such as Photoshop or Lightroom for your services, you most likely would have a preference for the Adobe RGB gamut which offers a significantly wider space than the conventional sRGB standard. Images appear more vibrant and colorful in this specification, allowing excellent editing and manipulation for enhanced outputs for your clients. Although, if you do not have a monitor capable of displaying images at these levels, then your efforts might seem futile. Most products that are exceptional at these applications are more or less at a thousand dollars, so for most users who are currently struggling for success, that is too much to pay. This situation is where the Philips 276E6ADSS comes in. 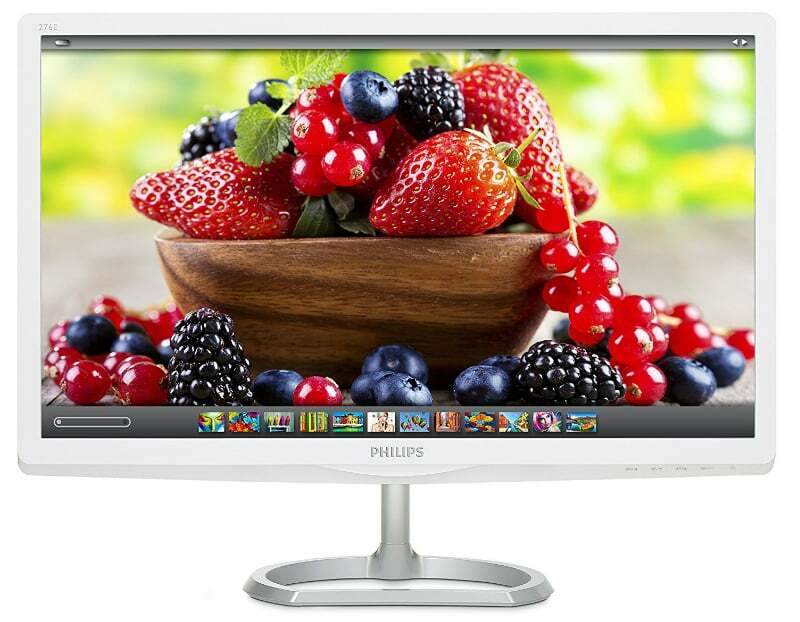 Costing only as much as an entry-level option, this offering from Philips is outstanding at one thing; it is capable of showing 99% of the Adobe RGB gamut, a characteristic found in products three times the price. The Quantum dot backlighting’s features offer improved brightness, saturation, and contrast better than most LEDs, so this ability translates the same benefits onto your already capable IPS panel’s output. The one thing this selection lacks is an ability to emulate sRGB colors, or in layman’s terms, to downplay the Adobe RGB colors to general levels which are widely used in mainstream media. Ordinary images such as those found on social media may appear heavily saturated or overly vibrant. This downside makes the monitor less flexible, as the limitation dedicates it to your Adobe applications. The product is also rather limited in physical features such as ergonomics, and the cabinet features a white plasticky appearance, a characteristic that better-built monitors are better at pulling off. Cheaper always comes with a drawback but getting a sub-$300 monitor for artistic ventures isn’t so bad, especially since you get a highly specialized feature at a wallet-friendly price. If you are looking for a well-rounded contender, the Benq PD2700Q is the next best thing without spending a fortune. This model does not offer an extensive Adobe coverage, but the near perfect sRGB range is more than sufficient for a good amount of professional work since most of the images on mainstream media do not require the wider Adobe standard to show its full colors. Also, unlike the previous selection in this category, this model is not dedicated to image editing alone, even if at a calibrated state, it still fares quite well. But what makes this product good is its feature-packed programming, which includes several modes for several applications. The most notable of which, is its CAD/CAM and Animation modes. These options are specially made for designers who use programs such as AutoCAD and Solidworks; and these programs have black backgrounds and creations are shown in linear form, or to be more specific, in mesh or wire frame appearance. This kind of work does not benefit much from color accuracy and vibrancy, but it does require a certain level of good contrast and clarity. In this regard, the IPS panel with its native resolution, extensive range of brightness adjustment, and the panel’s acceptable uniformity help a lot. This model does not perform up to par out of the box, but the plethora of tweaking options in BenQ’s favored OSD makes it easy to correct these irregularities without having the need for advanced ICC profiles or calibration tools. The best of the best usually commands a thousand dollars for ownership, but at this price point, the Benq PD2700Q is hard to beat. The first two models in this category offer useful features at friendly price points, making them attractive for start-up professionals, or even the already successful designers who are looking to squeeze every ounce of money they can save from buying monitors. However, for artists who cover a broad range of requirements from different clients may benefit from having the specific features the two previous choices are offering, into one solution. This scenario is there the Sw2700PT, the upmarket cousin of the Benq PD2700Q, comes in. This option offers the best of both worlds; a near perfect range in the Adobe RGB spectrum found in the Philips 276E6ADSS, and the versatile adjustments of the PD2700Q, plus a few more additional features to spice things up even further. Aside from the color gamut performance, the OSD in the SW2700PT offers emulation for sRGB and Adobe RGB, and quite interestingly, a Standard mode. The option to choose between these modes is what the budget option in this category severely lacks. On the other hand, the benefits of an excellent performance are immediately apparent as soon as you power this monitor up since BenQ has factory-calibrated the display, so the need to tweak to get the most performance out of this product is at a minimal. In another aspect, the higher IPS panel in this model and its accompanying benefits also feature a 10-bit LUT (look-up table), which means that the display is capable of showing 1.07 billion colors, against the 16.7 billion the lower tiered offerings provide. Coupled with the full gamut range, this results in smoother and crisp images without posterizing or over saturation. 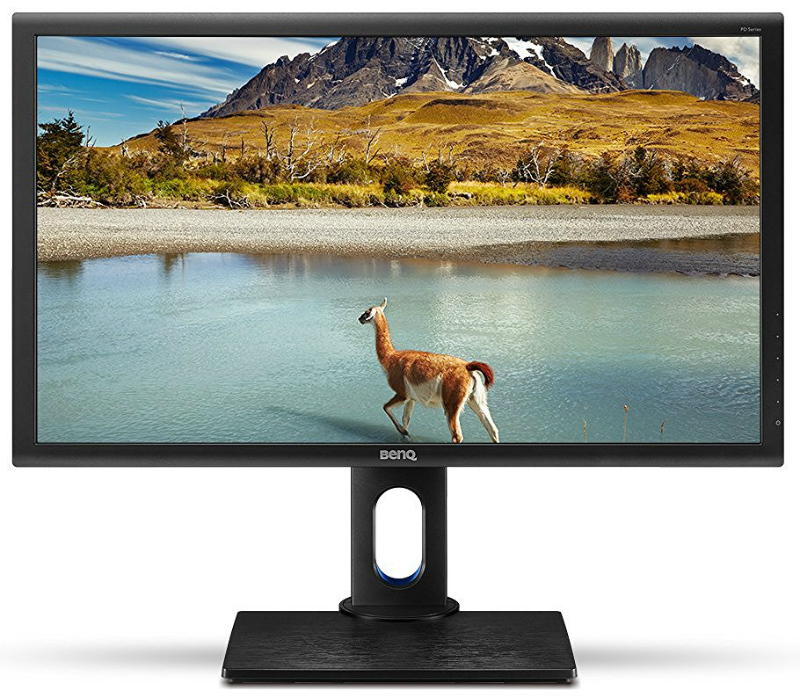 To further expand the meaning of value in this $600 monitor, BenQ also added useful accessories such the USB 3.0 hub and the shading hood, which according to BenQ, helps the monitor’s contrast by shutting out reflections and light from your room’s ambiance. These benefits are questionable to some, but additional accessories are always welcome. This feature set rarely comes in monitors without a 4-digit price tag, so even if the $600 BenQ is asking is borderline expensive, this model offers an exceptional value that most competitors can’t match. Products that can do well in all categories set in a buyer’s guide like this are few and far between, but the Asus PB328Q certainly earns a spot among the exceptional few. 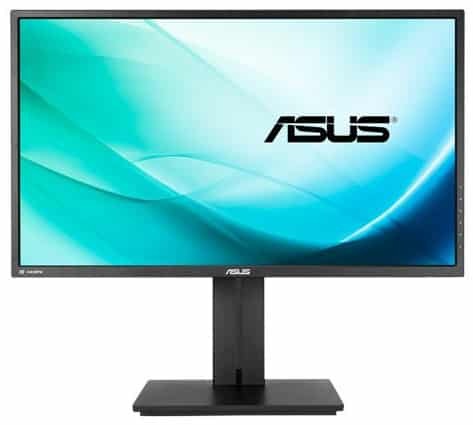 This model sits a tier below the professional branch of Asus’ ProArt Professional product line, but the 10-bit color depth, 100% sRGB coverage, and the acclaimed contrast level on the VA panel of this monitor makes this model worthy of the top-end ProArt moniker. Although, we are lucky Asus did not label it as such since it will raise the price from the already affordable cost of ownership with sits at $469. As if the fantastic image performance isn’t enough, the panel is capable of a 75hz refresh rate and low input lag, making this ideal for a certain degree of enjoyment in gaming. Only expensive 144hz gaming monitors are faster, but the difference is too little to notice, so probably only the pros will feel the difference. But for gaming at home, this is an exceptional product (and huge!) for your entertainment needs. 32 inches is massive once it sits two feet from your face, so the level of immersion and the expansive viewing space enables the user to enjoy the benefits of ultra-wide monitors without having to deal with the uncommon aspect ratio, its issues and additional pull from your hardware. These facts made this the best all-rounder in this selection, and the best value per dollar even if it still is considerably expensive when compared to most products included here. If these mind-blowing specs aren’t convincing enough, Asus paid incredible attention to build quality and detail on the PB328Q. The overall industrial look of the monitor may not appeal to all consumers, but for most, this is acceptable since extra bling and additional lighting are distracting and they add to the overall cost. One physical feature that we love about this product is the tactile joystick for navigating the OSD and its rich features and adjustment options. You don’t typically find this on a product marked for general use, and it is a component found in ROG Swift or ProArt monitors. For less than $500, you get all the right stuff from Asus’ top offerings, without the extras and the hefty premium. Screens in this category are mostly considered as luxury products and the perceived benefits of having a curved display are gimmicky, at best. But at an objective point of view, there are valid reasons a person who is interested in this sort which can justify the exuberance that entices the interest in these beautiful devices. For one, you get more virtual desktop real estate, and I do mean a lot. You can nearly double your viewing space when comparing to conventional 1080p monitors, without consuming a lot of space and the accompanying mess of cables passing through. A single ultra-wide device is also less taxing on your hardware, so you save on power while extending your device’s lifetime. Curved monitors also enhance your viewing experience, although this benefit may be subjective or case to case depending on each person. But we do have to admit that the perceived peripheral visual extension has its advantages, especially in gaming, not to mention that the promised enhanced immersion is also easier to achieve since your eyes sit at a suitable level and distance contrary to how it does on a decent-sized TV sitting at least four feet away. These facts, in essence, getting monitors of this kind demystifies the contractions between the extravagance and the merits of getting a display product in these forms. Although far more affordable than a multi-display setup, these products still can get quite expensive when compared to conventional 16:9 screens. If you’re banking on curved monitors as a luxury purchase while wanting the benefits of the flat screen offering above, then the LG 34UC88-B, the sexier sibling of the 34UM88C-P, is the answer to the $900 you are willing to spend. There is little no difference between the two regarding image quality, so all intents and purposes for the other selection are also applicable to this option. But what sets these two apart other than the stimulating curve of the 34UC88-B, is that this model has a slightly faster 75hz refresh rate than its sibling. Couple that with the Freesync technology on this model, smoother gaming, and less blurring is ensured making this option the better choice if you are more serious about gaming than professional applications. One downside to choosing this over the other is that you sacrifice contrast noticeably, as the trait goes down to a rather disappointing level, even if the panel on this screen has a considerably higher brightness limit than the previous choice. Curved screens are also prone to light bleeding at the corners, and this flaw is inherent in most of the products of this type. There is a chance that you can get a panel that does not suffer as much as some of the worse examples, but the risk is there, and it is up to you to justify the benefits against this gamble. Even so, this is the best choice you can get with a perfect balance between form and function, business and entertainment and pricing between competitors. This model was introduced at over a thousand dollars, and at its current price point, it becomes an excellent choice you can make. Only the more expensive gaming specific curved ultra-wide products are currently better in performance, at the time of this writing. If you scour the web, you will have a lot of other products sporting 1440p as a native resolution, especially since tech giants are releasing new products regularly. Most of these newer models, however, are for gaming purposes, and that is another story all by itself. You have to remember that gaming is the highest industry standard in computers since the genre pushes the limits of the current technologies and hardware available. 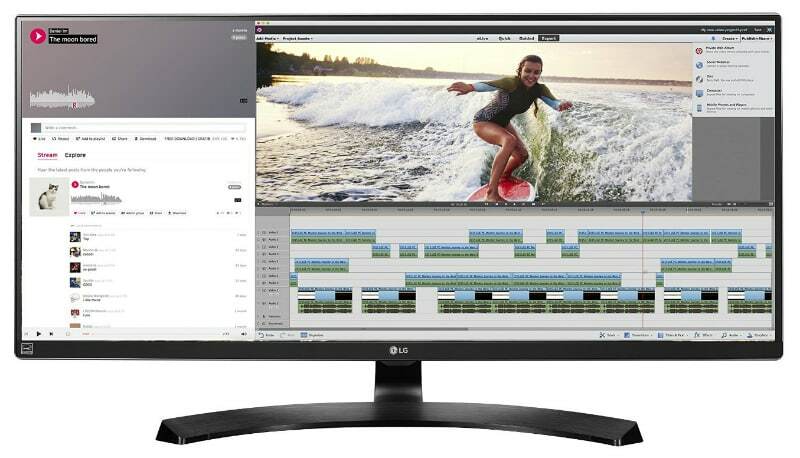 On the other hand, professional applications are requiring every advantage a device can provide, and judging from the increased size in virtual desktop space and helpful features built into these 1440p monitors; it is safe to say that this category is a beneficial tool in upgrading productivity as well. The products we have selected for this guide are meant to bridge the gaps between these two applications, and these models may not seem like they are the latest or the best of the best, but they currently offer the best value and performance you can get per hard earned dollar that you are going to invest. 1440p is the next best thing between upgrading and overall cost, and as you can see in this buyer’s guide, there are wallet-friendly but feature-packed options to choose from, if you are in the market for an upgrade or a new build. While not as detailed as 4k, this category still offers a massive difference if you are coming from 1080p, without the huge requirements to utilize the benefits efficiently. In my opinion, for the sizes featured in this selection, 1440p is the perfect scale to maximize benefits without getting something oversized. 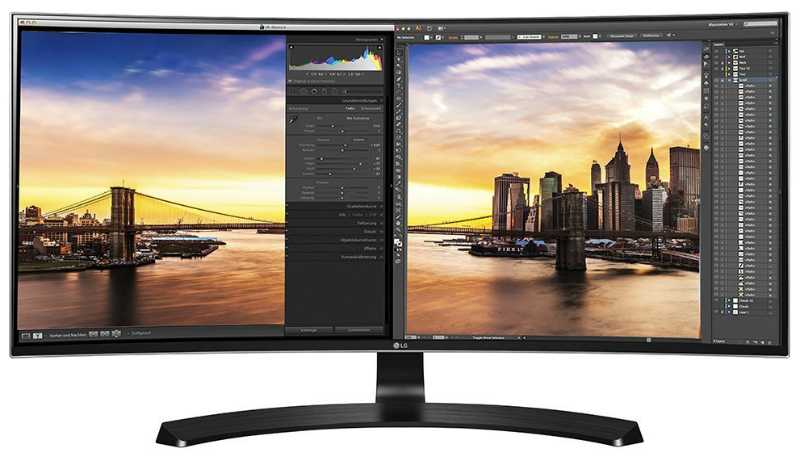 24-inch FHD monitors are slowly becoming too small for masses, while the ideally sized 4k display products are too big for regular-sized desks. This fact is another point further proving that 1440p bridges a huge gap between the two other popular resolutions. If future proofing is a concern, do not fret; the current market trends in monitors dictate that this is the next mainstream resolution which will replace FHD, but even that might take a few years more. why are they all 60-75hz? that’s awful for the eyes, and just not smooth at all. Hi Don Mega, the choices we wrote this article based on practicality and the needs of the masses. Some aren’t willing to spend the extra cash for a fast monitor, and some might not appreciate what 144Hz brings to the table. Hi Dr. Ed! Thank you for reading and liking our article! WQHD simply means Wide Quad High Definition which equates to a 2560 x 1440 resolution. The difference between other types is simply the pixel count on the vertical and horizontal axis of the panel. If you have further questions, we would be happy to help! Thank you. You don’t explain what WQHD is and what distinguishes it from the other models, if anything.